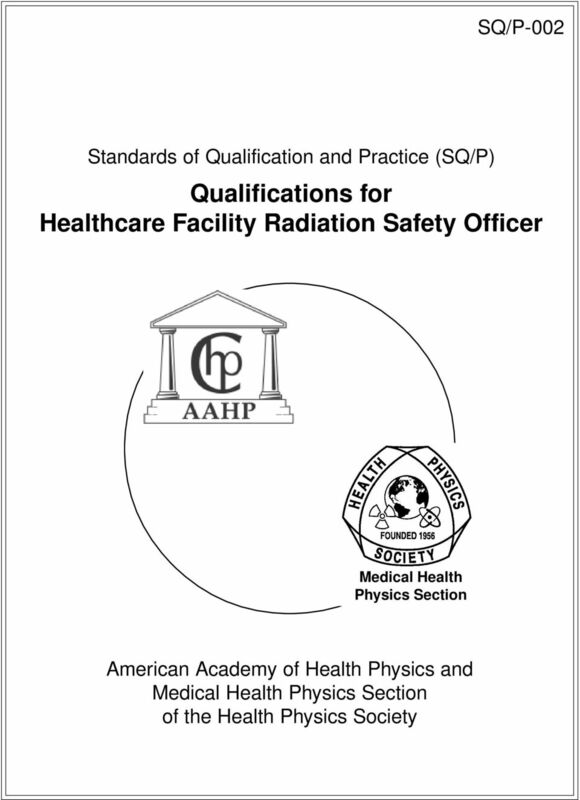 Download "Qualifications for Healthcare Facility Radiation Safety Officer"
11 Attachment 1 Recommended Combinations of Training and Minimum Experience for a Healthcare Facility RSO Formal education and certification* Minimum experience** Large healthcare organization Includes radiation oncology, diagnostic and interventional radiology, and diagnostic and therapeutic nuclear medicine. A. Comprehensive certification by the American Board of Health Physics or the American Board of Medical Physics in Medical Health Physics AND A. 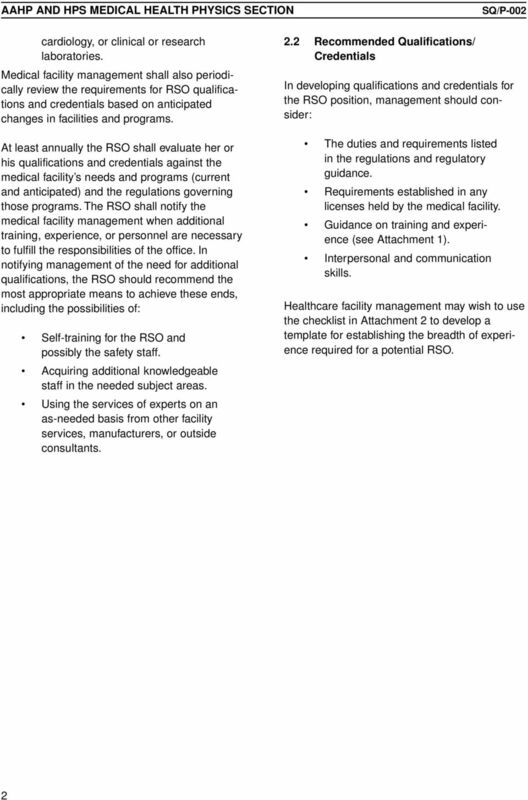 Two years beyond training in a program with radiation safety problems similar to those in the program to be managed. OR B. Graduate degree in health physics, medical physics, radiation physics, nuclear engineering, radiation biology, nuclear physics, or a closely related field* AND B. 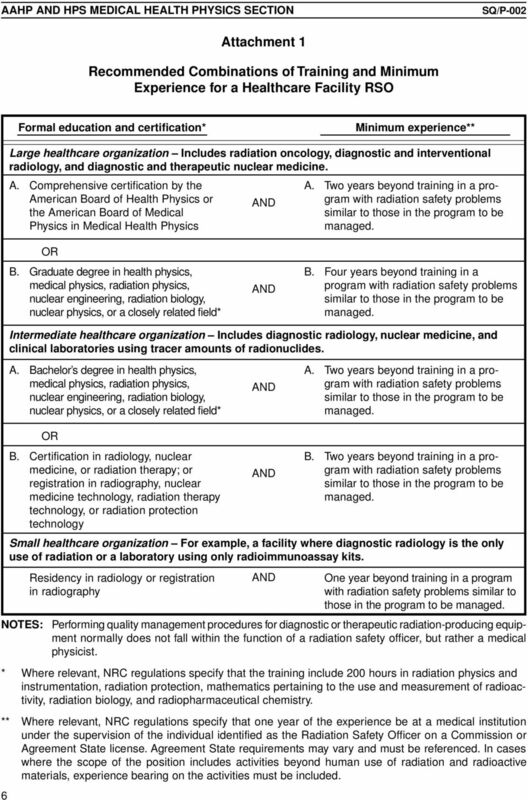 Four years beyond training in a program with radiation safety problems similar to those in the program to be managed. Intermediate healthcare organization Includes diagnostic radiology, nuclear medicine, and clinical laboratories using tracer amounts of radionuclides. A. Bachelor s degree in health physics, medical physics, radiation physics, nuclear engineering, radiation biology, nuclear physics, or a closely related field* AND A. 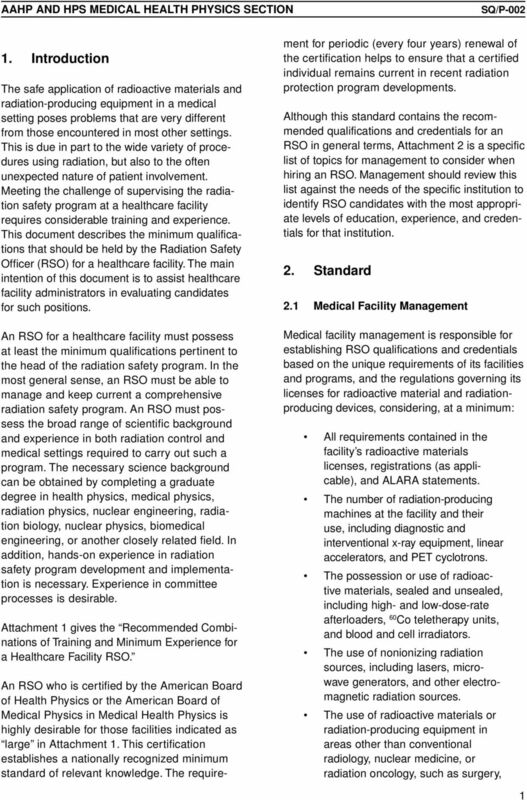 Two years beyond training in a program with radiation safety problems similar to those in the program to be managed. 6 OR B. 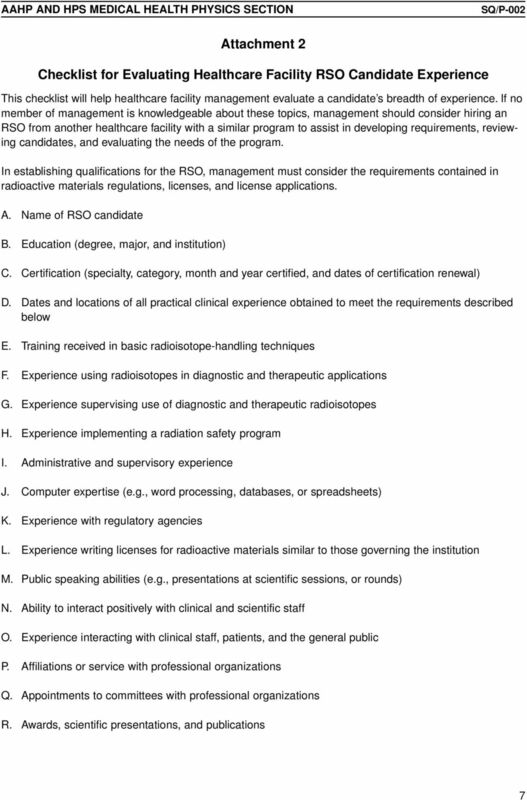 Certification in radiology, nuclear medicine, or radiation therapy; or registration in radiography, nuclear medicine technology, radiation therapy technology, or radiation protection technology NOTES: Residency in radiology or registration in radiography AND AND B. Two years beyond training in a program with radiation safety problems similar to those in the program to be managed. Small healthcare organization For example, a facility where diagnostic radiology is the only use of radiation or a laboratory using only radioimmunoassay kits. 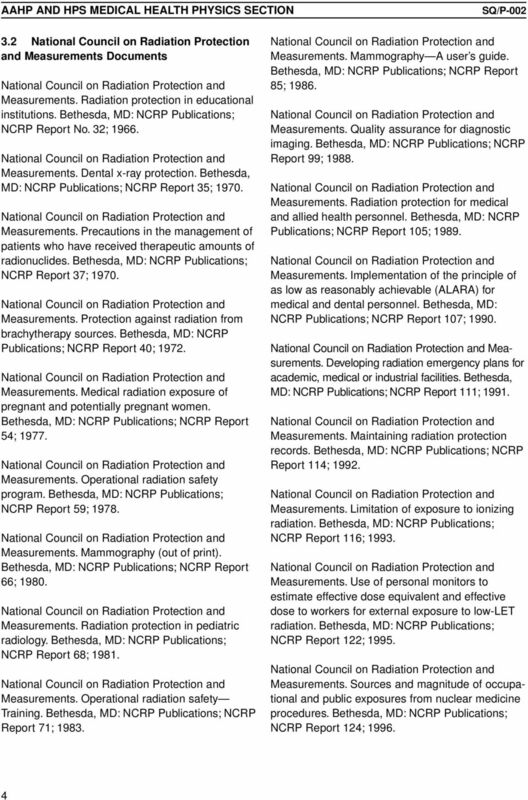 One year beyond training in a program with radiation safety problems similar to those in the program to be managed. 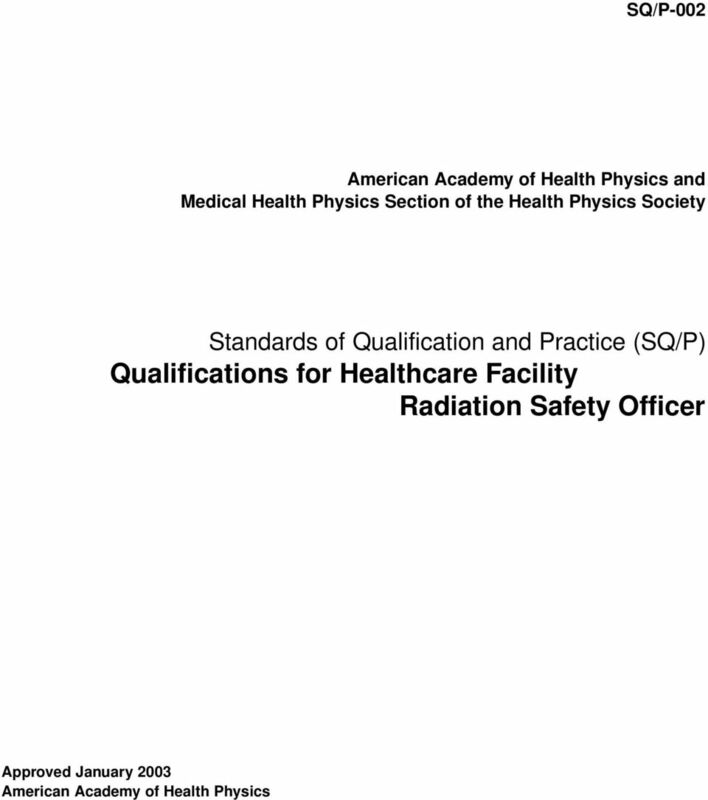 Performing quality management procedures for diagnostic or therapeutic radiation-producing equipment normally does not fall within the function of a radiation safety officer, but rather a medical physicist. 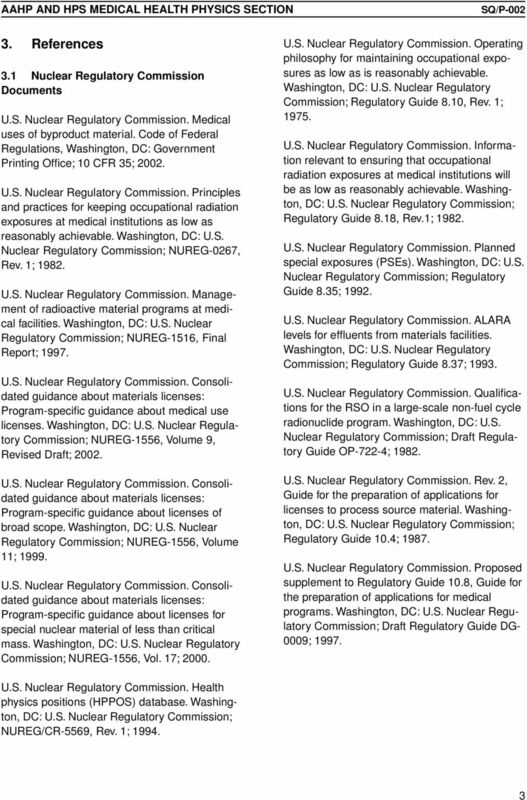 * Where relevant, NRC regulations specify that the training include 200 hours in radiation physics and instrumentation, radiation protection, mathematics pertaining to the use and measurement of radioactivity, radiation biology, and radiopharmaceutical chemistry. 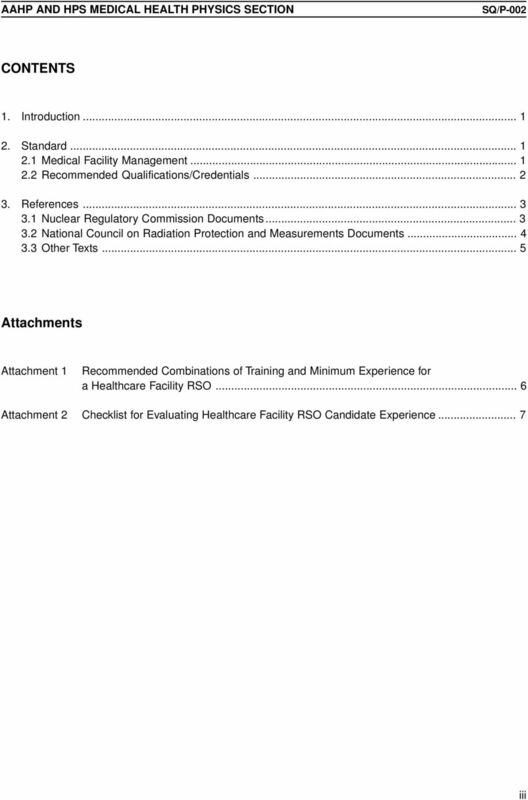 ** Where relevant, NRC regulations specify that one year of the experience be at a medical institution under the supervision of the individual identified as the Radiation Safety Officer on a Commission or Agreement State license. Agreement State requirements may vary and must be referenced. In cases where the scope of the position includes activities beyond human use of radiation and radioactive materials, experience bearing on the activities must be included. 13 This page was intentionally left blank. AAPM REPORT NO. 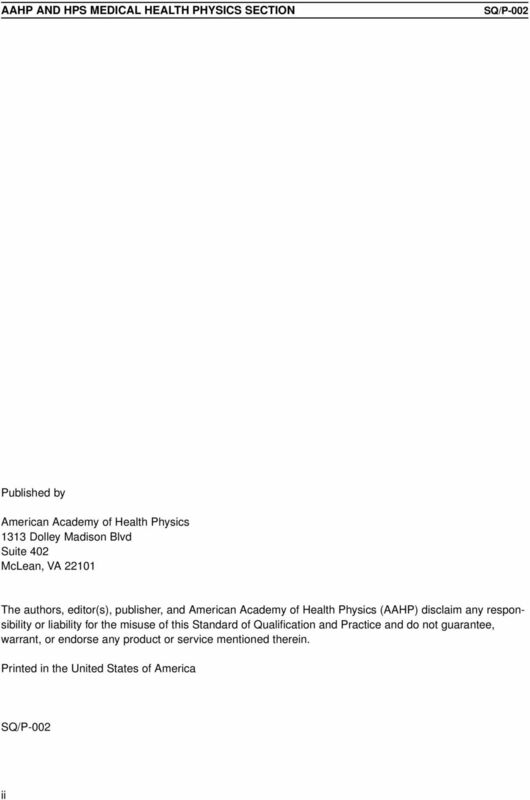 42 THE ROLE OF THE CLINICAL MEDICAL PHYSICIST IN DIAGNOSTIC RADIOLOGY Published for the American Association of Physicists in Medicine by the American institute of Physics AAPM REPORT NO. A. Principal Investigator: Responsible for scientific aspect of study. OFFICE OF ENVIRONMENTAL HEALTH AND SAFETY Approved by: Date: August 2014 2014 University of New Hampshire Office of Environmental Health and Safety. University of New Hampshire Page 2 All rights reserved. The Field. Radiologic technologists take x-rays and administer nonradioactive materials into patients' bloodstreams for diagnostic purposes. WHERE IN THE WORLD JILL LIPOTI? 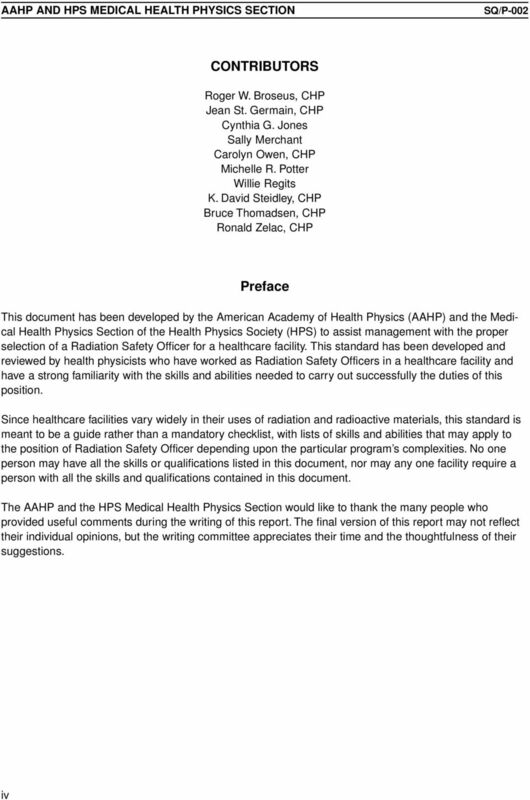 Management of a Comprehensive Radiation Safety Program in a Major American University and Affiliated Academic Medical Center T. T. Yoshizumi, R. E. Reiman, V. Vylet, J. R. Clapp, W. R. Thomann, and K.
Information Sheet: Radiation Source Use and Replacement Study Background Radiation sources are used extensively in the United States for industrial applications, research, and medical diagnosis and treatment. Learning Outcomes 53.1 Explain how x-rays are used for diagnostic and therapeutic purposes. 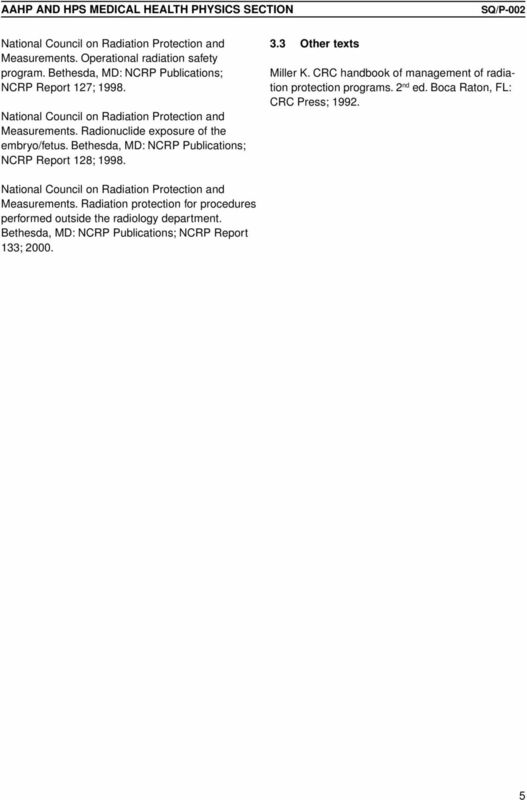 53-2 CHAPTER 53 X-rays and Diagnostic Radiology 53.2 Compare invasive and noninvasive diagnostic procedures.